All Licensed Foils and Latex MADE IN USA. 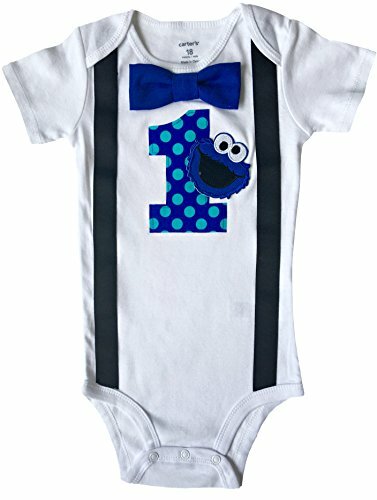 With this kit you will receive: (1) 35 inch Jumbo Cookie Monster Shape Foil Balloon, (1) 34 inch Giant Blue Number 2 Shape Foil Balloon, (2) 21 inch Chocolate Chip Cookie Balloons, (1) 18 inch Birthday Present Balloon, (6) 11" Qualatex Latex Balloons 2- Pale Blue, 2- Dark Blue and 2- Brown with White Polka Dots. Just add Helium and ENJOY! 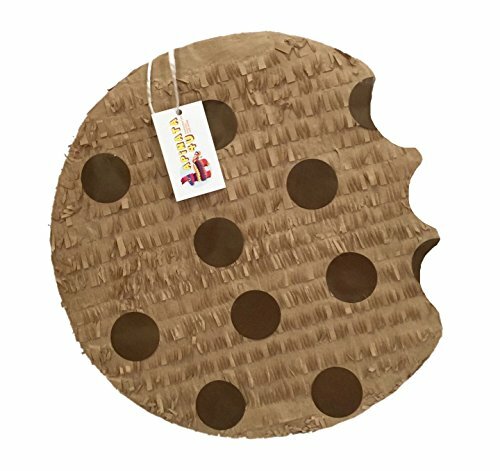 APINATA4U Chocolate Chip Cookie Bitten Pinata 16"
All of the balloons are Brand New, some may not be in original packaging but they are new. They are purchased in bulk and the savings is passed on to you! The balloons are as pictured. All the balloons are double sided, the same picture is on the front and back.All my balloons are BRAND NEW deluxe helium quality from the manufacturer. The balloons are not filled, you can fill at your local grocery store, discount store, or florist, or rent a helium tank from your local party store or welding company. You can also air fill it and tape to the wall or attach balloon sticks. If using air, insert a straw carefully into the self sealing opening and blow, then remove and it will seal. Please note that mylar will last about 1-2 weeks, latex will only last about 8-24 hours, so best to inflate those just prior to your party, although actual float time varies. Just be sure to use the correct inflator. A black nozzle tip will be used for latex balloons, and a gold narrow tip should be used for mylar balloons. If you use a larger latex black inflation nozzle on helium balloons, you risk over inflation of the balloon and harming the self sealing properties and this may cause early deflation. 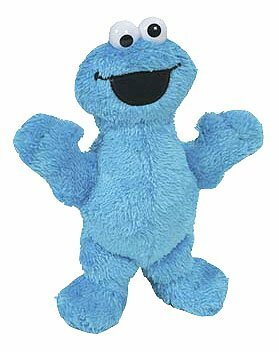 This 9" Cookie Monster take-along pal is perfectly sized for preschoolers to take on the go! This toy also helps encourage development of Social & Emotional Development and Imagination. 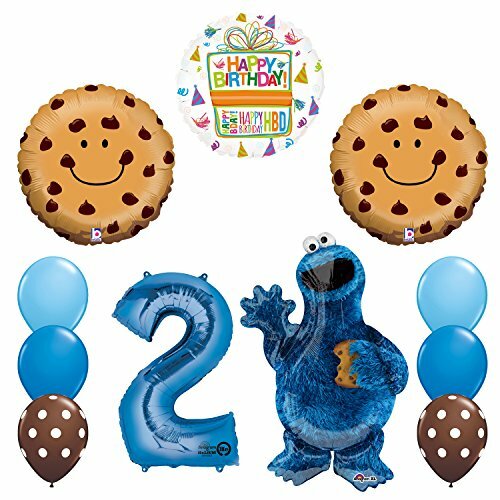 All Licensed Foils and Latex MADE IN USA.With this kit you will receive: (1) 35 inch Jumbo Cookie Monster Shape Foil Balloon, (2) 21 inch Chocolate Chip Cookie Balloons, (1) 18 inch Birthday Present Balloon, (6) 11" Qualatex Latex Balloons 2- Pale Blue, 2- Dark Blue and 2- Brown with White Polka Dots. Just add Helium and ENJOY! All Licensed Foils and Latex MADE IN USA. 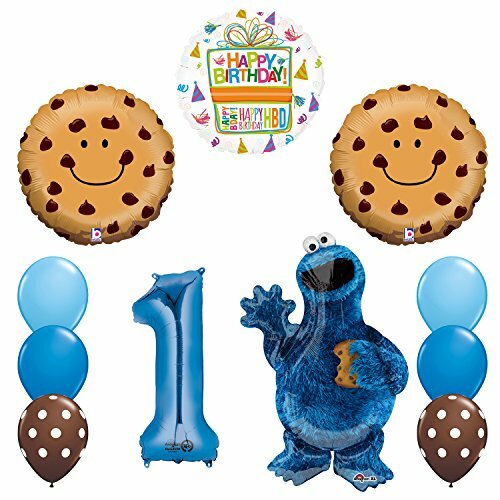 With this kit you will receive: (1) 35 inch Jumbo Cookie Monster Shape Foil Balloon, (1) 34 inch Giant Blue Number 1 Shape Foil Balloon, (2) 21 inch Chocolate Chip Cookie Balloons, (1) 18 inch Birthday Present Balloon, (6) 11" Qualatex Latex Balloons 2- Pale Blue, 2- Dark Blue and 2- Brown with White Polka Dots. Just add Helium and ENJOY! This kit includes: (1) 42" Giant Elmo Fun Banner Foil Balloon, (1) 35" Cookie Monster Foil Balloon, (1) 27" Ernie Head Foil Balloon, (1) 25" Bert Head Foil Balloon, (2) 18" Sesame Street Fun Friends Foil Balloon, (2) 19" Red Star Foil Balloons. Just add Helium and ENJOY! All Licensed Foils and Latex MADE IN USA. 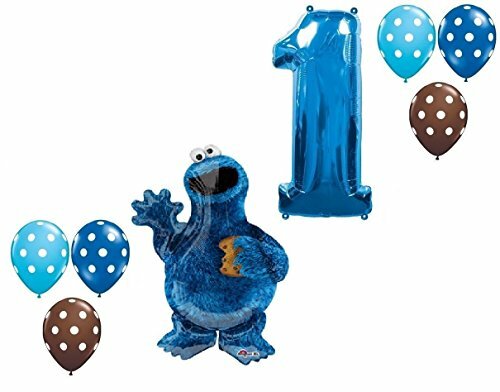 With this kit you will receive: (1) 34" Elmo Foil Balloon, (1) 35" Cookie Monster Foil Balloon, (2) 18"Sesame Street Happy Birthday Foil Balloon, (1) 18" Round Birthday Present Foil Balloon and (6) 11" Assorted Color Polka Latex Balloons. Just add helium and Enjoy! 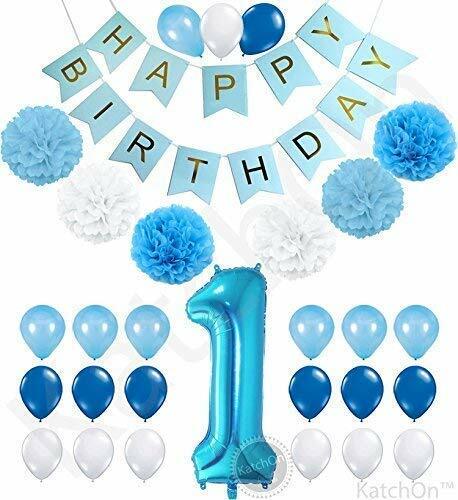 This listing is for a 14 piece Cookie Monster Happy Birthday balloon decorating kit! Perfect decorations for your Cookie Monster themed Birthday Party! 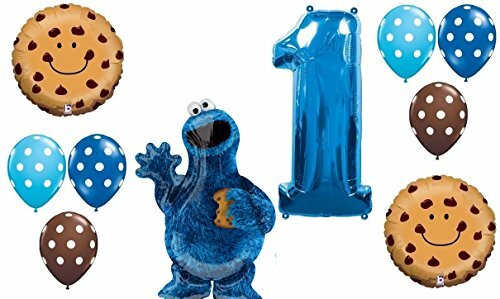 You will receive with this kit: One (1) 31" XL Cookie Monster shape mylar balloon. Two (2) 18" Chocolate Chip cookies mylar balloons. Two (2) 18" Blue Happy Birthday with presents star mylar balloons. Nine (9) Coordinating latex balloons...3 blue, 3 brown, 3 goldenrod. All you do is add Helium (AND FUN!) Sure to be a hit at your party! AND MY SPECIAL FREEBIE "THANK YOU"... Enough curling ribbon in coordinating colors to attach to all balloons! All Balloons are new and are shipped uninflated.